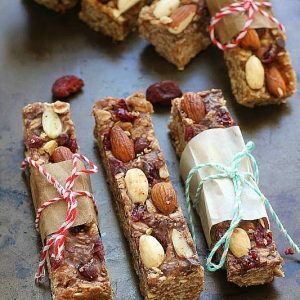 Chewy Granola Bars with Almond & Cranberry - No Bake - a healthy, satisfying snack made all in one pot with NO butter, have no REFINED SUGAR added, and are VEGAN and GLUTEN FREE with certified gluten-free oats. Line a 9x9 square pan (for thicker bars like in the pictures) or a 9x13 rectangular pan for thinner bars with parchment paper or foil that has been lightly sprayed with cooking spray leaving an overhang over the pan for easy removal of bars. Add dates and water to a medium pot on medium-low heat. Mash down with a fork and continue stirring and mashing while the mixture heats up. The dates should soften after about 3-5 minutes. Continue mashing and stirring until paste becomes smoother and uniform. It is okay to see some chunks still - as long as it is a uniform paste then it is ready to use. Once the date paste is smooth and softened, add peanut butter and coconut oil to the pot. Stir constantly to combine and remove from heat once the mixture is smooth and the coconut oil has melted (about 1 minute). Remove from heat and stir in vanilla extract. Pour in the oat flour, shredded coconut, ground cinnamon and salt (if using) and mix in gently. Toss in the rolled oats and flaxseeds and combine gently with a spatula or large spoon. Fold in the sunflower seeds and half of the almonds and cranberries. Pour granola mixture into prepared pan. Spread evenly and press down firmly using a flat spatula. Sprinkle remaining almonds and dried cranberries evenly. Press down firmly again with a spatula or your hands to flatten and bind together. Chill in the freezer for 1 hour or refrigerator for 3 hours or overnight to set. Remove from the freezer or fridge and use the foil overhang to transfer the uncut bars to a cutting board. Using a sharp knife, cut into even rectangles. Store the bars in an airtight container in the refrigerator. If you have to stack them, be sure to use parchment paper or foil in between the layers, otherwise they'll stick together. Bars are best enjoyed straight out of the fridge since they tend to soften up at room temperature. These bars aren't super sweet, so if you prefer something sweeter you can always add a touch of sweetener. I used a 9x9 square pan for the bars as pictured since I like them thicker. You can choose to use a 9x13 pan if you like thinner bars. I find the thicker bars hold up better. Bars are best enjoyed straight out of the fridge since they tend to soften up at room temperature. If you have to stack them, be sure to use parchment paper or foil in between the layers, otherwise they'll stick together. They keep well in an airtight container in the refrigerator for up to 1 week or store in the freezer for up to 1 month.